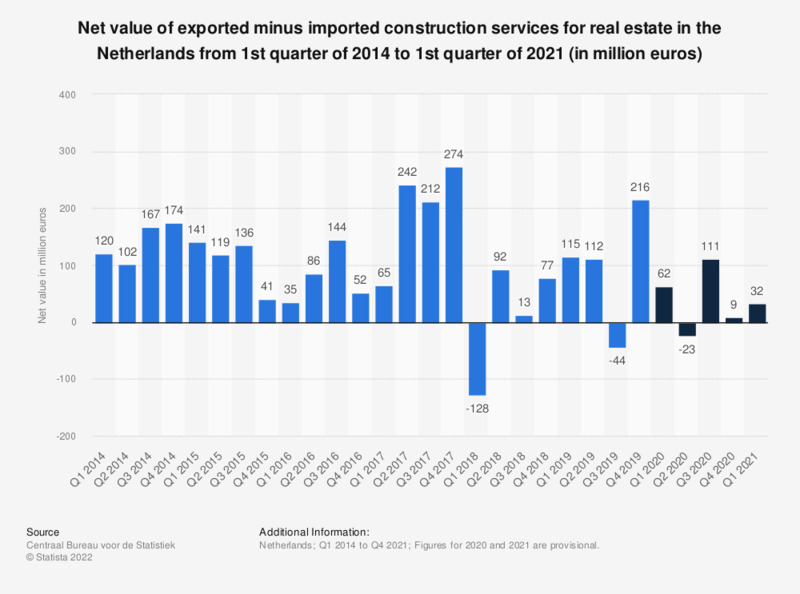 This statistic shows the net value of exported minus imported construction services for real estate in the Netherlands from the first quarter of 2014 to the third quarter of 2018 (in million euros). The source states, construction services include services which are "conducted abroad by Dutch residents: construction and related activities abroad, as well as the goods and services these Dutch companies obtained abroad, to use in foreign construction projects". It also includes construction services conducted in the Netherlands by non-residents. The source notes, this includes: "construction and related activities in the Netherlands by non-resident companies, as well as the services and goods obtained in the Netherlands by these non-resident companies, to use in Dutch projects". In the third quarter of 2018, Dutch exports for construction services exceeded the imports and lead to a positive net value of 39 million euros. The numbers mentioned are calculation from two tables. The other table can be found here.